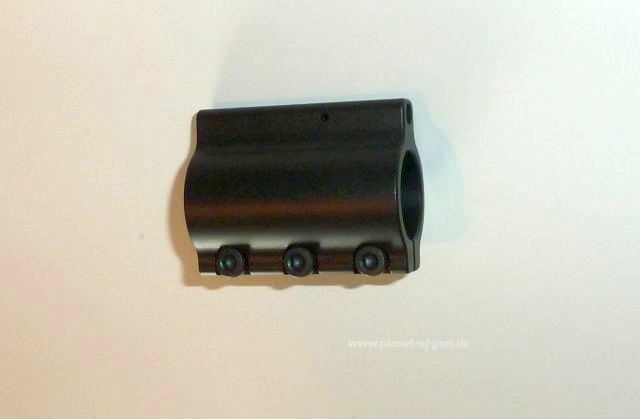 DAR Gasblock von vorn zu verstellen im .750er (ca.19mm) Maß - absolute Spitzenqualität!!! DAR Gasblock von vorn zu verstellen im .936er (ca. 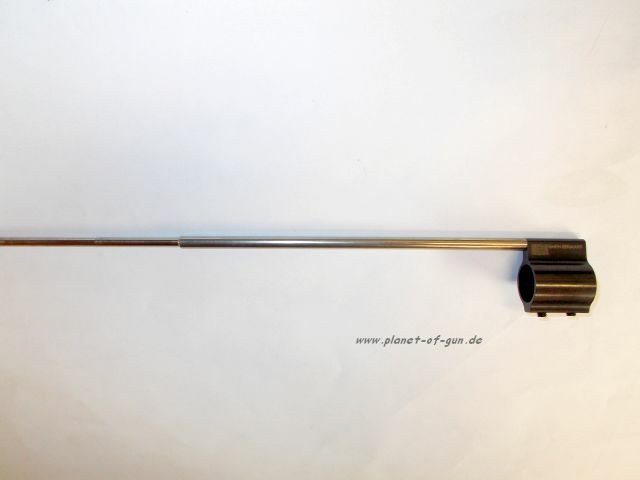 23,7mm) Maß - absolute Spitzenqualität!!! DAR Gasblock von vorn zu verstellen im 1" Maß - absolute Spitzenqualität!!! Einstellbarer Gasblock mit integrierter Gastube. Aufgrund der festen Montage der integrierten Gastube kann ein Gasdruckverlust am Gasblock ausgeschlossen werden. Der übliche Pin zur Sicherung der Gastube entfällt. 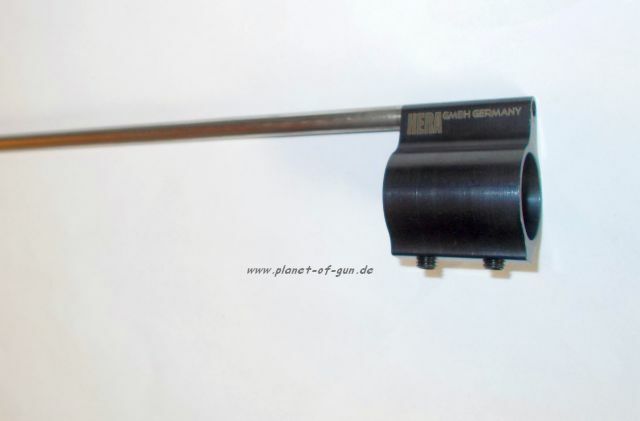 Der Hera AGS ist von vorne über eine Innensechskantschraube einstellbar und als "Low-Profile-Gasblock" ausgelegt. Andere Hersteller und Größen auf Anfrage ! Flip up sights deploy instantly to keep you operational if the primary sight system on your flattop AR-15 fails or loses effectiveness in low light conditions. Push-button controlled, positive locking, ball-detent system snaps sights firmly into position when you need them and locks them down when you don t. Folded sights allow a completely unobstructed view through optics and won t snag on brush, clothing, or gear. 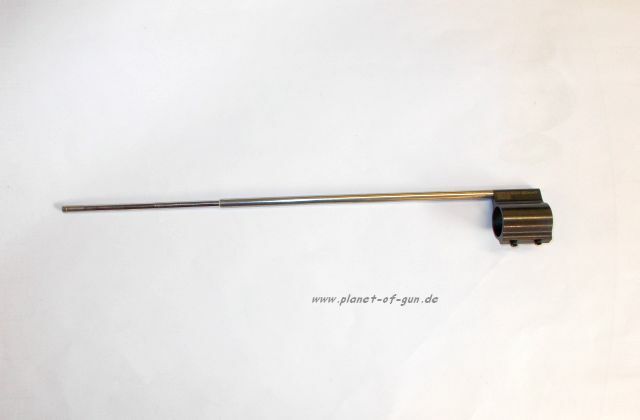 Large, spring-loaded button is easy to find and operate, even under stressful conditions. 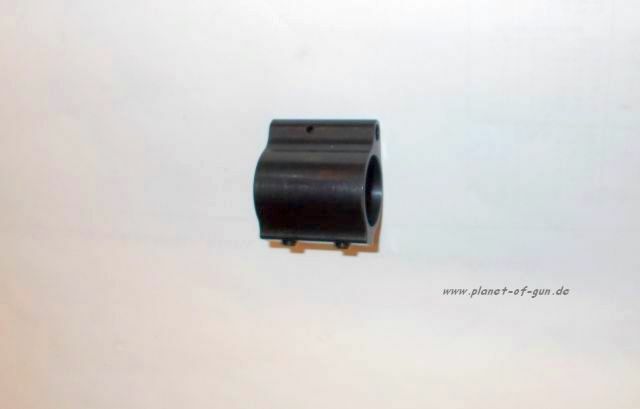 Protective hood over front sight posts and ears around rear sight aperture guard against damage during rough handling. Rugged, machined steel and aluminum construction will stand up to years of hard use. Durable, matte black, mil-spec finishes resist corrosion. 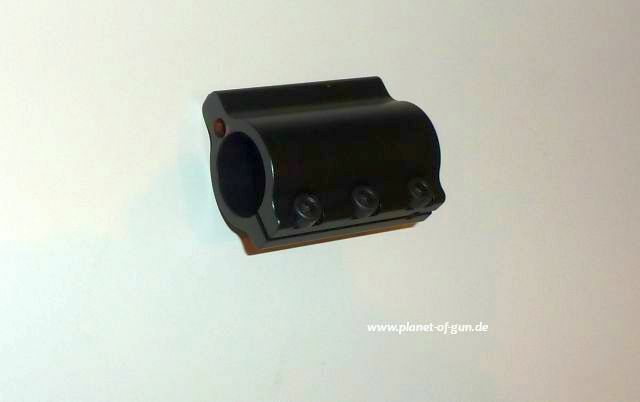 Barrel Mount Front Sight - Solid, 4140 steel integral gas block/sight base clamps on .750" diameter barrel. Hex head crossbolts pull clamp halves tight to barrel to completely immobilize sight when properly tightened. Lightweight aluminum sight body comes with A2 sight post installed; also accepts aftermarket posts. 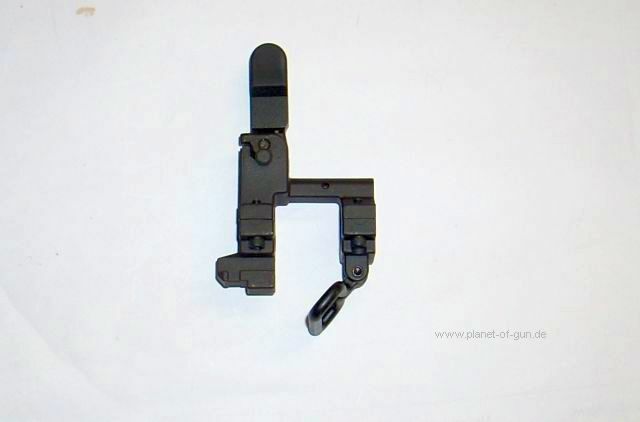 Sight assembly folds to the rear when retracted. 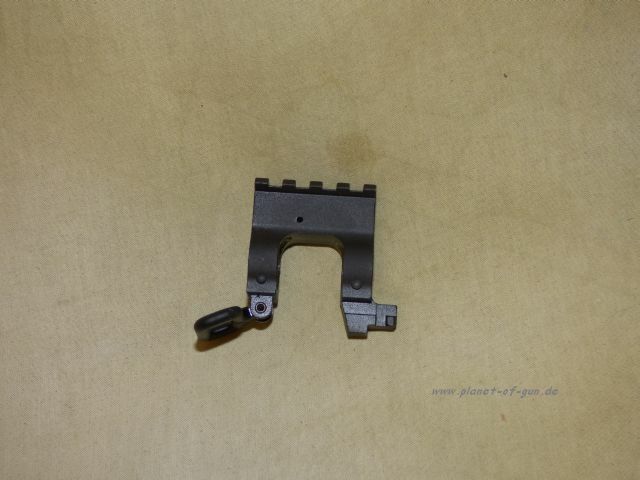 Rail Mount Front Sight - Functions like the barrel mount front sight when installed on a Picatinny style forearm rail positioned at the same height as the receiver rail. Folds to the rear in the down position. Rail Mount Rear Sight - Low-profile, windage-adjustable sight allows the use of optics and folds down compactly to the rear when not in use. A2-style same-plane aperture system is designed to flip between .090" and .195" diameter peep openings without losing zero. Ensures the correct sight picture for both close up and long range targets. SPECS: 4140 steel base, Parkerized, and aluminum hardcoat anodized; matte black finish. 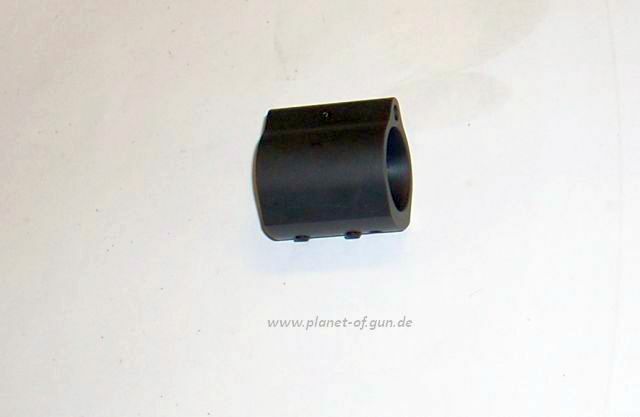 YHM-9395 Front Sight Gas Block, no lug Yankee Hill Gasblock mit klappbaren und verstellbaren Korn für Laufdurchmesser .750 (ca.19mm) ohne den Bajonetthalter!